This item is not available for purchase online. Please call us at 800.606.6969, or visit our NY Superstorebfvtytqcfdefrfsuefduttwcbz. 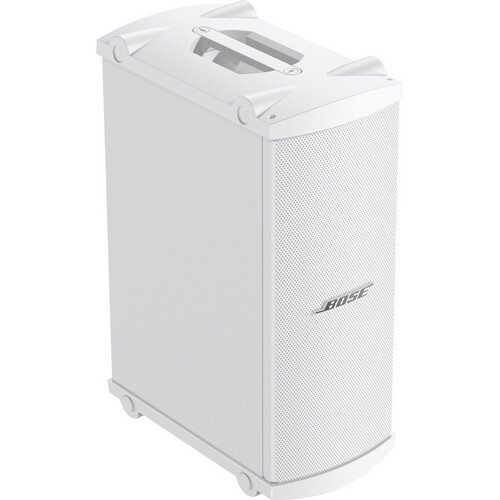 The white PANARAY MB4 Modular Bass Passive Loudspeaker from Bose is a 200W, low-frequency loudspeaker that can be used for permanent installations indoors, or for portable applications. This speaker can be matched with amplifiers such as the Bose 1600 or 1800, as well as others rated for 4 or 8 ohm loads. An advantage to using a Bose 1600 or 1800 amplifier with the MB4, is that an MB4 plug-in EQ card can be installed into the amp to provide active equalization. The MB4 speaker’s output, bandwidth, and size make it useful as a single bass unit, or as a modular building block to match other Bose products in a professional system. MB4 Modular bass loudspeakers are designed to be wall mounted. They can also be configured as bass arrays, using the MB4 Endfire or Broadside spacing in conjunction with the Bose PANARAY system digital controller. No stands are required for portable use. Box Dimensions (LxWxH) 31.0 x 22.5 x 15.0"